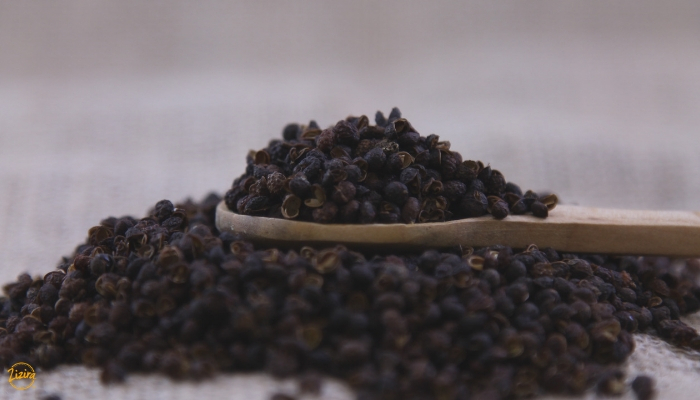 In medieval Europe black pepper, like other spices, was a commodity of the nobility and the rich, coveted not only for the flavours it imparts on cuisines but also for its purported medicinal properties. Europeans of those days had so dismal geographical knowledge that they thought spices had mystical origins. Spices were limited in supply then, a fact which inspired voyagers like Christopher Columbus, Ferdinand Magellan and many others to venture across oceans into new worlds in search of exotic merchandise. These discoveries of new sea routes and lands triggered the early inroads into globalization and expanded trade and commerce. Black pepper actually stood out as king of spice that kick-started the spice routes between Europe and the Malabar Coast of Southern India (where it originated), Malaya and other parts of Asia. Black pepper was valuable back in the days that it was even used as currency instead of gold to make payments, even for payment of ransoms. Metaphorically speaking, it was black gold. Soon enough the battle for control over spices and other commodities of trade and trades routes themselves eventually led to many conflicts, conquests and colonisations, changing the world’s history like never before. Europeans once believed black pepper grew on trees guarded by poisonous serpents. To harvest the fruits farmers must first drive the serpents underground by burning down the trees. That’s how peppercorns got their shrivelled black coats they say! No other spice in the world is probably more popular, loved, and extensively used. Name any dish or cuisine and black pepper more often than not must be among the ingredients. Its sharp, pungent zest seeps deep into the repast, and the unmistakable whiff of its aroma swirls about in the air. In fact, you can’t imagine any kitchen that didn’t have a can of peppercorns or a bottle of powdered pepper or a pepper mill. In South India, more often than not dishes come flavoured with pepper, be it vegetables or meats or soups or tea! In Europe and the United States black pepper is the staple for preserving meats, seasonings, or marinades. Black pepper’s signature aroma emanates from the berries of the tropical Piper nigrum vine, one among the thousand species of the Piperaceae family. 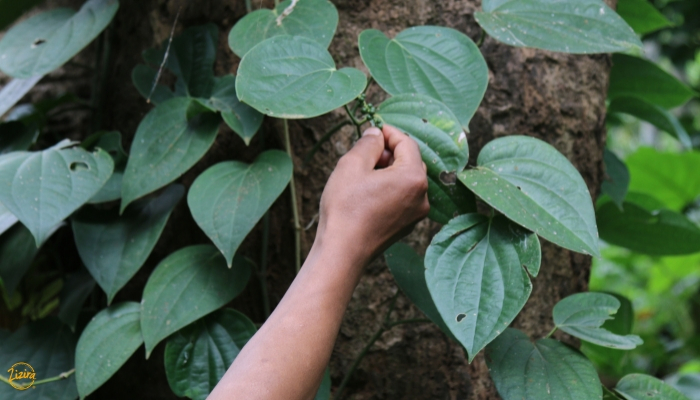 Our Piper nigrum – literally black pepper – is a stout and woody vine, with nodes at intervals from which roots spring out. It is a monoecious plant, that is, both male and female flowers sharing the same spike. It needs the support of poles or props to climb, and reaches up to heights of over 5 metres. The fruits cluster as berries on spikes. Vietnam is the world’s top producer and exporter and accounts for 43% of the global production, followed by India, Brazil and Malaysia. The USA and Europe are the major international markets. India produces 15% and is also the largest consumer though its rate of cultivation is on a downtrend, despite its pepper being of a more superior quality. Karnataka is the highest producer of black pepper in India (45%), closely trailed by Kerala and Tamil Nadu, Puducherry and Andaman and Nicobar islands. The North-eastern region is still virgin land for pepper cultivation, accounting for only 8% of the country’s output. But now it is identified as having the potential to compete with the Southern States. Meghalaya, which grows the high yielding Panniyur-1 and Panniyur-2 varieties, could presently garner only 0.7 metric tons per hectare as compared to Karnataka’s 1.2 metric tons per hectare. With proper management, pepper could also become a revenue generati­­­ng black gold for Meghalaya farmers. Pepper thrives well in tropical climates, at altitudes between 0 to 1500 metres and temperatures between 10°C and 40°C with at least 200 mm of annual rainfall. It can grow in a wide range of well-drained soils, especially laterite, with pH of between 5.5 to 6.5. The favourable factors of the Northeast’s hilly terrain can make for excellent growing areas for commercial production. In Meghalaya, the government appears to be aiming for this. Since pepper vines love the shade, multi-cropping with other crops like areca nut, rubber, orchard crops, coffee and forest trees will make pepper plantation even more viable, simultaneously reducing the need for props, besides accommodating more plants per hectare. One area needing address is the post-harvest process of threshing (separation of berries). In the absence of machinery, Northeast farmers thresh by manually trampling on the spikes, which is cumbersome and unhygienic as well. To better the situation the Spices Board of India has initiated provision of pepper threshing equipment, which should help quicken threshing, and bring out a cleaner product. The next processes of blanching, drying, grading and packaging then become easier. Green pepper – unripe fruit; harvested 10-15 days before maturity. Black pepper – fully matured berries. 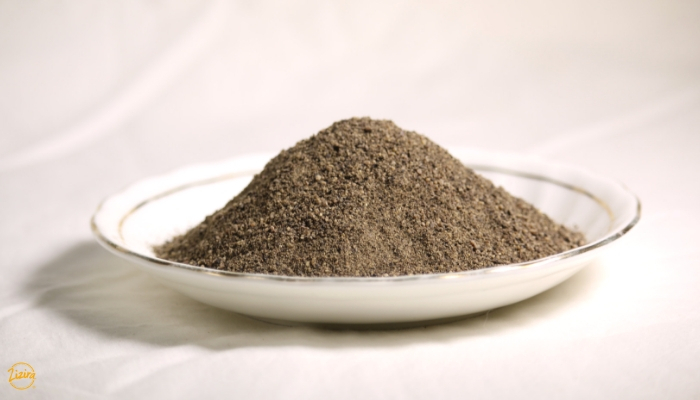 Powdered pepper – made from black pepper. 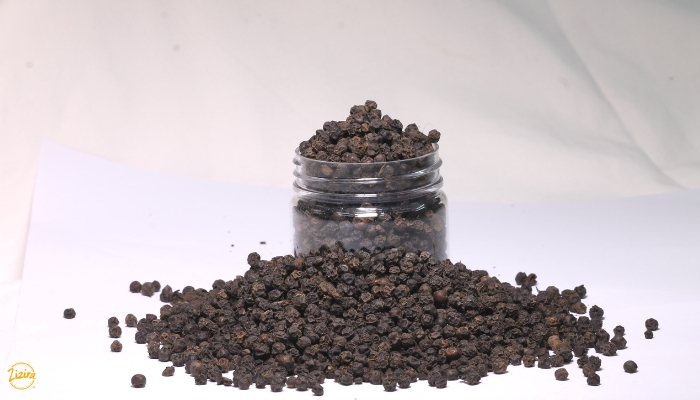 White pepper – fully ripened berries with coats peeled off through ‘retting’ process – soaking in water for a week, with frequent changes of water – then dried to moisture level of 12%. Canned pepper – harvested at 4 to 5 months. Pepper’s essential oils and oleoresins – from berries harvested 15-20 days before maturity. Is Black Pepper Good for Us? Besides, it has Vitamins A, C, E, K and the B Vitamins, the electrolytes sodium and potassium; and minerals calcium, copper, phosphorus, iron, magnesium, manganese and zinc. Then there are the phytonutrients beta and alpha-carotene, cryptoxanthin, lutein-zeaxanthin and lycopene. Even a pinch of pepper on our foods will do us a world of good! What Black Pepper Do Besides Spice up Your Kitchen? As medicine black pepper is amazing. Used in food it becomes medicine too. It helps banish cold and flu from the respiratory system by calming sore throats, clearing nasal passages, reducing fever and relieving coughs. Pepper helps in bronchitis and improves blood circulation. Used in soups it warms up the body. It helps the digestive system by triggering more stomach hydrochloric acid that aid digestion of food proteins. This, in turn, stimulates the digestive enzymes and helps reduce heartburn, get rid of gas, ease constipation and prevent diarrhoea. In aromatherapy, piperine, the essential oil which imparts pepper’s characteristic pungency and taste, eases aching muscles and relieves inflammatory arthritis. Pepper’s antioxidant properties fight free radicals and help prevent oxidative damage to the body’s cells. It is also a nerve pain reliever and a topical application of it does away with scabies. Pepper enhances the bioavailability, or absorption, of turmeric enabling the body to make use of turmeric’s great healing properties. How to Consume Black Pepper for Best Results? Never in excess; only moderate sprinklings, to spice up foods, beverages, salads, soups, or sherbets. 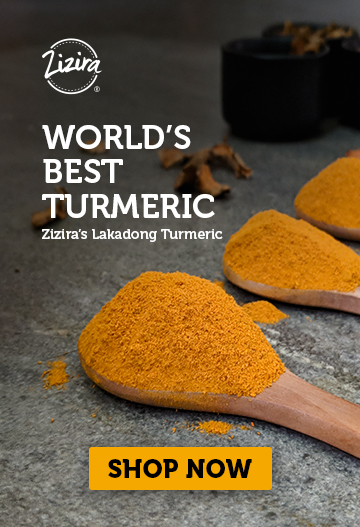 Or, in combination with other spices like turmeric, cumin and cinnamon, even honey for more potent blends. Adding it to your cuppa tea along with a dash of ginger will do you good in more ways than one, besides relieving fatigue, boosting up the immune system and preventing the body from oxidative stress. Black pepper. Truly, the king of spices.